The Reel Deal Video Slot Guide & Review - Casino Answers! The Reel Deal is a 20-line video slot featuring scatter wins, wild substitutes, free spins and a bonus game. It is available on all Vegas Technology casinos, including English Harbour Casino and Crazy Slots Casino.Play at this years #1 online casino for United States - Slots.LV. If you couldn’t already tell, The Reel Deal is a cleverly named take-off of the hit game show “Deal or No Deal.” The symbols in Deal Or No Deal are various stacks of cash, a couple of models, the show’s host, a phone, the shadowy banker and a cheque for $1,000,000. The look and feel of the slot machine is familiar to anyone who has ever seen Deal or No Deal on television. Bets on The Reel Deal are $0.01, $0.05, $0.10, $0.25, $0.50, $1, $5 and $10. Each line equals one coin. To bet on one line, hit the “Bet One” button. For each click, you will add an extra line all the way up to 20. To bet on all 20 lines, hit “Bet Max,” and you will automatically spin the reels with the all lines active. The Reel Deal can work as a penny slot, or high rollers can bet $200 on a spin. Wager more to increase your chances of winning and making it to the bonus round. If you hit 5 gold briefcase bonus symbols on any active line, you will trigger the Reel Deal bonus game. If you have never seen Deal Or No Deal, here are the rules: You must choose your briefcase out of the 26 present on screen. Your briefcase will then be put into the bottom-left corner of the screen. In the first round of the game, you must eliminate six briefcases. The idea of the round is to eliminate the lowest valued briefcases. Once you pick a briefcase, the value will be displayed on the screen. After you have eliminated the first six briefcases, you will be offered a deal by the banker. You may choose to accept the deal or you can go back to the game and eliminate five more briefcases in the second round. You will then receive a second offer, which will be lower or higher depending on which briefcases you have eliminated. If you choose not to take the offer, you then will have to eliminate another four briefcases. This goes on until you either accept the banker’s offer or there are only two briefcases remaining. You can win up to $100,000 playing The Reel Deal bonus game. Wild substitute in The Reel Deal is a gold bar. Hit 5 Gold Bars and you will win the top jackpot of 10,000X your bet. The scatter symbol is a “Deal” button. You only need two scatter symbols anywhere on the reels to receive a payout. If you hit 5 scatter symbols, you will win 1000X. The Reel Deal has a full-featured autoplay setting. You can choose your number of spins (up to 500), number of seconds between spins (great for those who want to celebrate) and advanced stop settings. The Reel Deal’s bonus game isn’t triggered often, but when it is, it’s definitely worth it. 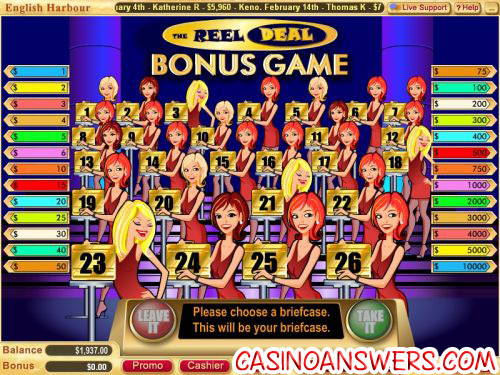 It is one of the best bonus games around, whether you’re a fan of the Deal or No Deal game show or not. The bonus game alone earns The Reel Deal very high marks from where we stand! For a great deal to maximize your online casino bankroll, you can get four 100% up to $200 bonuses when you sign up and deposit at English Harbour Casino. Are USA players allowed to play The Reel Deal? Yes! 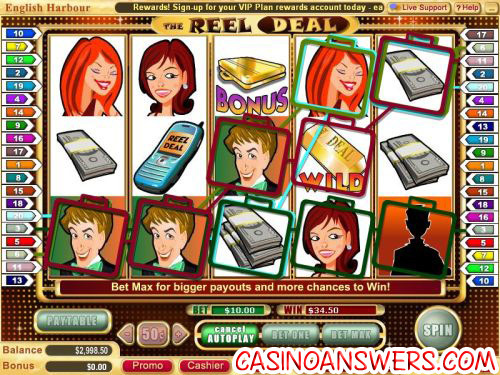 You can play The Reel Deal at any of the casinos we have listed in this review. We highly recommend English Harbour Casino when it comes to trust, fairness, safety and security. Does The Reel Deal have a progressive jackpot? No, The Reel Deal does not have a progressive jackpot. However, we feel The Reel Deal’s bonus game more than makes up for the lack of a progressive jackpot. For those in need of a progressive jackpot slot machine, Vegas Tech casinos like English Harbour Casino and Crazy Slots Casino have plenty, including Mega Money Mine, Pay Dirt, Red White and Win, Treasure Trail and Win Place or Show. Is there a Deal or No Deal Slot Machine game?